I was looking at Amiciness’s stats over the years because I was looking for a trend for my next Six Sigma project. Joke. No, I just felt like I needed to pivot our data in Microsoft Excel, and maybe, AsNTM producers may find this useful. You’re welcome. Quick background, the blog was officially a “.com” in 2015 but we started blogging way back in 2013, when Asia’s Next Top Model started. Although we have a small following on other areas, majority of our readers and viewers are AsNTM fans. Most of our popular posts are AsNTM-related, even on Youtube. I guess it’s safe to say that we can correlate Amiciness views with how well netizens have received each AsNTM cycle. Data on cycles 1 and 2 are not as reliable; we weren’t on WordPress yet at that time. Ladies and gents, here are some notable observations based on Amiciness numbers gathered from January 2015 to May 2018. Based on our numbers, AsNTM 4 posts had the most number of views. This was Yu Tsai and Cindy’s first season together. This was also the first time Team Philippines had three representatives: Julian, Alyssa and Gwen. Alyssa quit the competition for undisclosed reasons. There was no main villain in this cycle but Sang In had a run-in with Subaru exec Glenn Tan for rolling her eyes. 🙄 Julian couldn’t make Yu Tsai happy. And for the first time ever, nobody from Team Philippines made it to the top three. We were rooting for Tugs and so was the whole of Mongolia and the title winner was Tawan from Team Thailand. Based on Amiciness data as of May 14, 2018, Cycle 4 ranks first, followed by Cycle 5 and 3. 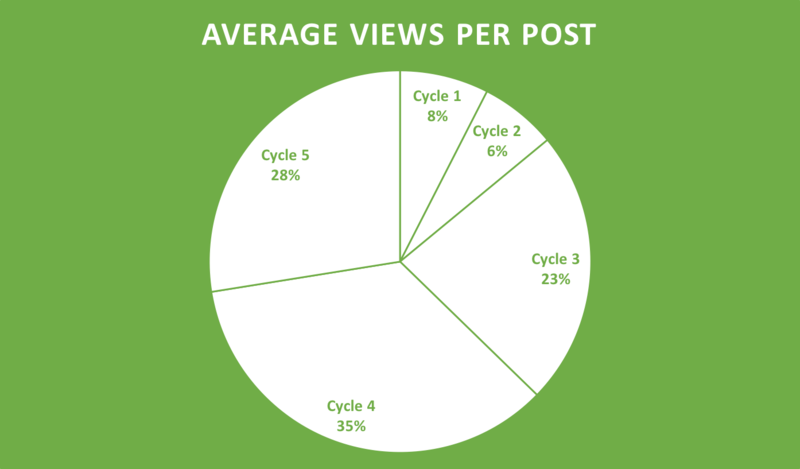 Although we only had one post for Cycle 1, it surpassed Cycle 2 by a number of views. The most viewed AsNTM related post of all time was a post introducing the new cast of AsNTM: new host Cindy (following Georgina Wilson), new model mentor Kelly (replacing Joey Mead-King) and the new creative director Yu Tsai. Cindy and Yu Tsai have stayed until the current Cycle 6, while Kelly departed the show after cycle 4. Interestingly, the most viewed post in a day was AsNTM 3’s Final Four episode. The competition was on and four ladies (Monika, Amanda, Gani and Aimee) remained in the running for the most coveted title. Eventually, Amanda got eliminated and Gani won that season. Cycle 4’s pilot recap also had the most number of views among the others. Interestingly, it was followed by Cycle 3’s. For me, Cycle 4’s finale was the most anti-climactic but ironically, it had the most number of views among the other AsNTM finales. Everybody expected Sang In to bag the prize but everyone was blindsided when Tawan became the AsNTM 4 winner. AsNTM4’s Subaru shoot also had the most number of views. This was followed by Cycle 3 and Cycle 5. I won’t reveal the numbers but Cycle 5 didn’t even make half of the views of Cycle 3 and 4. AsNTM3’s Subaru episode was the most discussed based on the number of comments. It had 44 comments including my replies to our very passionate readers. I had fun reading your comments. Hopefully in AsNTM6, our discussions will be as intelligent as it was in Cycle 3. The most popular AsNTM5 episode was the Neutrogena shoot. It was the one where Nametha had best photo but was eliminated because she was using wifi in the model house. What do you think? Do you also have some insights? What was your favorite AsNTM cycle? I wanna know, really. Vote on the poll below.